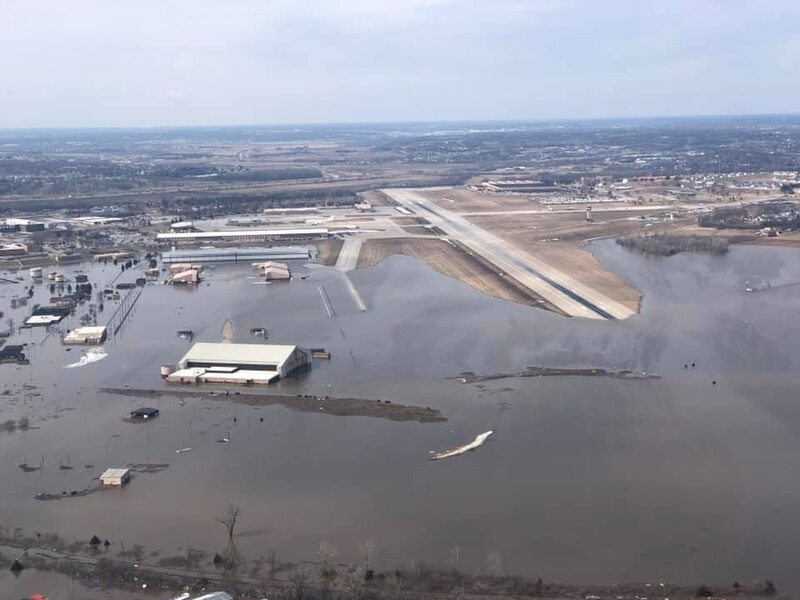 Offutt Air Force Base officials in Nebraska hope the floodwaters that overwhelmed one-third of the base this weekend — swamping dozens of buildings, much of the flightline, and prompting the evacuation of several aircraft — will start significantly receding by the end of the week. Col. Michael Manion, commander of the 55th Wing at Offutt, said in a Facebook post Sunday evening that the water had remained at the same level for about 12 hours, and was not expected to rise further. Ryan Hansen, a spokesman for the 55th Wing, said on Monday that some water has already started to slightly recede. Hansen said nine aircraft — eight RC-135 Rivet Joint reconnaissance aircraft and an E-4B National Airborne Operations Center that belongs to Global Strike Command — were flown away from the base over the weekend. The Rivet Joints were flown to Nebraska’s Lincoln Air National Guard Base, about 50 miles away, and MacDill Air Force Base in Florida, Hansen said. Roughly 60 structures in all, including 30 buildings, are now flooded, with water reaching as much as eight feet high in some buildings, Hansen said. Offutt’s two-mile flightline is also severely flooded, Hansen said. At its peak, Hansen said about 3,000 feet of flightline was flooded, though that has receded slightly. Hansen said that Offutt’s base housing — including official Offutt homes that were off-base — is all out of the flooded area and was undamaged. But an unknown number of Offutt personnel live in communities that were severely affected by the floods, he said. Only mission-essential personnel are working at the base, which also hosts U.S. Strategic Command. Hansen said about 1,300 personnel, who worked in the now-flooded buildings, are at other temporary locations. The storm produced record flood levels for several Midwest rivers and forced the evacuation of hundreds of homes. And more rain is predicted Tuesday. Floodwaters started to creep onto the base Friday, Offutt officials said. Early that day, the base evacuated the Base Lake and personnel began trying to hold back the waters with 235,000 sandbags and 460 flood barriers. But with waters advancing fast and flooding reaching so high, the sandbagging effort was abandoned late on Saturday, Hansen said. “We did as much as we could to try to contain the infrastructure,” Hansen said. The report found climate change is a threat to more than two-thirds of operationally critical installations. Manion said in a Saturday night post that the nine evacuated aircraft had been launched “in an extremely narrow window.” The 55th Wing has 45 aircraft in all. By Sunday, water had also reached about 30 buildings, including headquarters facilities for the 55th Wing, 55th Security Forces Squadron, 97th Intelligence Squadron, and 343rd Reconnaissance Squadron, the base said. The Bennie L. Davis Maintenance Facility also had two feet of water inside, Manion said. All streets south and east of the Offutt Field House are also impassible, the base said. Manion shared photographs of the flooded airfield on Sunday. Offutt is the second Air Force base to sustain major damage from a natural disaster in recent months. Hurricane Michael slammed into Tyndall Air Force Base in Florida last October and caused so much damage some wondered if the base would ever recover. Sen. Deb Fischer, R-Neb., will provide full support for Offutt as it recovers, spokesman Dan Dunham said in an email Monday. But it will be a long road to recovery. Dunham said it will likely be several weeks before a detailed damage assessment is available. Work on that assessment can only begin once the floodwaters recede, operations for immediate protection of life and property end, and engineers can get in to survey the damage. Manion yesterday declared only mission-essential personnel should show up at Offutt until further notice.